Citrus Juice Drink with Sweetener and Fortified with Vitamins. Get the Sunny D feeling! Say hello to the unique taste of Sunny D! We carefully blend zingy citrus fruits with sweet, refreshing Florida oranges - it's the taste of sunshine happiness! Vitamin D is often called the "sunshine vitamin" because we can make it ourselves through safe sun exposure. But we need it all year round to help our bodies absorb calcium, vital for strong teeth, bones and muscles. 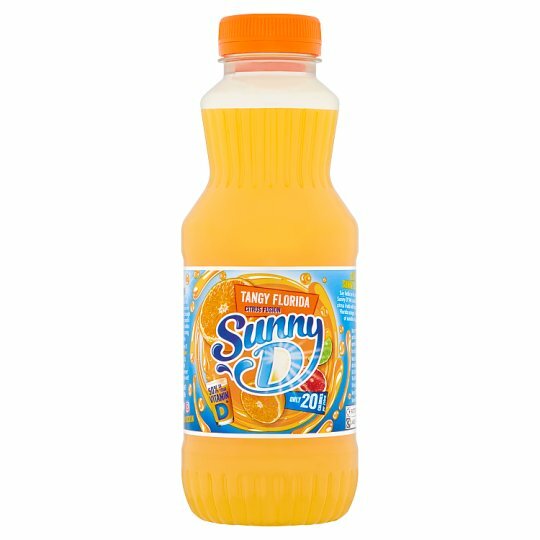 *A 250ml glass of Sunny D will give you 50% of your daily need of Vitamin D, so you can enjoy that Sunny D feeling, whenever you like, wherever you are! Keep refrigerated., Once opened, consume within 5 days., For Best Before Date see lid. Serve chilled and shake up before opening.